A privately funded team hoping to win a multimillion-dollar race to the moon has figured out how it's going to get most of the way there — aboard a commercial rocket that could launch in 2013. The team Astrobotic Technology Inc., which aims to take home the Google Lunar X Prize, has signed a contract with private spaceflight firm Space Exploration Technologies — SpaceX for short — to launch its robotic payload to the moon aboard a Falcon 9, Astrobotic officials announced Sunday (Feb. 6). The mission could launch as soon as December 2013, team officials said. Astrobotic's expedition will search for water and deliver payloads, with the robot narrating its adventure while sending 3-D video. An additional $10 million has been set aside for second place and various special accomplishments, such as detecting water, bringing the prize’s total purse to $30 million. The Google Lunar X Prize expires whenever all prizes are claimed (or, failing that, at the end of 2015). Twenty-one teams are currently in the race. Astrobotic, a spinoff from Carnegie Mellon University in Pittsburgh, Pa., is counting on SpaceX to get its payload off the ground. Astrobotic is the first Google Lunar X Prize team to announce a launch contract with SpaceX, prize officials said. 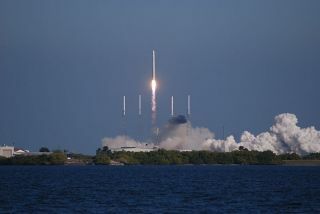 SpaceX — which in December became the first private company to successfully return a spacecraft from Earth orbit — usually charges between $49.9 million and $56 million for a launch to low-Earth orbit. But it's lowering its prices for the prize. "SpaceX is a Preferred Launch Partner, having offered substantial discount to all Google Lunar X Prize teams as a way of further fostering exploration and innovation," officials wrote on the X Prize website. The Falcon 9 upper stage will sling Astrobotic on a four-day cruise to the moon. Astrobotic will then orbit the moon to align for landing. The spacecraft will land softly and precisely using technologies pioneered by Carnegie Mellon for guiding autonomous cars, team officials said. The rover will explore for three months, operating continuously during lunar days and hibernating through lunar nights. The lander will sustain payload operations, helping to provide power and communications, officials said. Astrobotic wants to win the $20 million, but its ambitions don't stop with the Google Lunar X Prize. "The mission is the first of a serial campaign," Red Whittaker, chairman of Astrobotic Technology and founder of Carnegie Mellon's Field Robotics Center, said in a statement. "Astrobotic’s missions will pursue new resources, deliver rich experiences, serve new customers and open new markets. Spurred further by incentives, contracts, and the Google Lunar X Prize, this is a perfect storm for new exploration."